Have you seen a chimpanzee? Maybe you have seen a picture at the zoo or in their natural habitat in Africa. Their food mostly consists of plants and fruit, but they sometimes eat insects, fish and eggs. 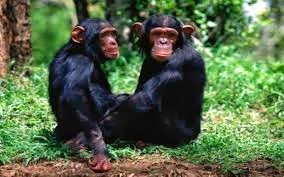 Chimpanzees live in large groups called communities. The community makes a huge nest out of tree branches. They weave the tree branches and twigs together either in the top of one large tree or string them between two. Chimps use leaves to pad the nest, making it cozy. The nest can be as large as 16 ft. across. Sometimes they sleep alone in the top of trees, especially when taking naps. In a community there is always a dominate male. In our story, the dominate male is Themba, pronounced TEM-bah, which means "trusted." 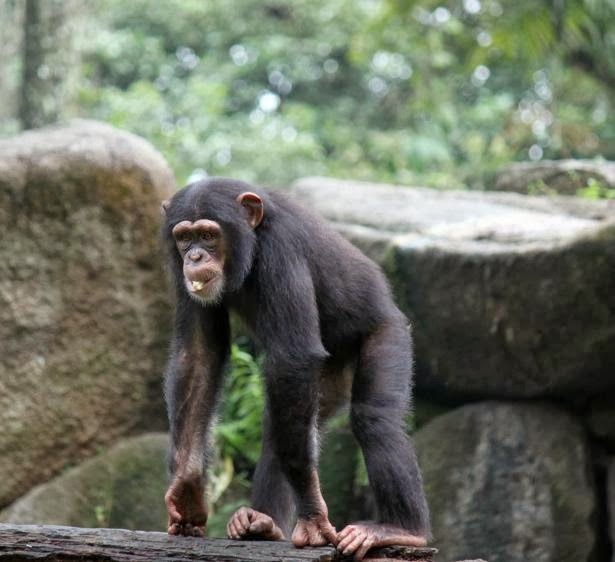 Sade, pronounced SHAW-Day and means "sweetly singing," has two young chimps. The oldest is Ada, pronounced AH-dah and means "oldest daughter," and the youngest is Yenee, pronounced Ya-NAY and means "mine." 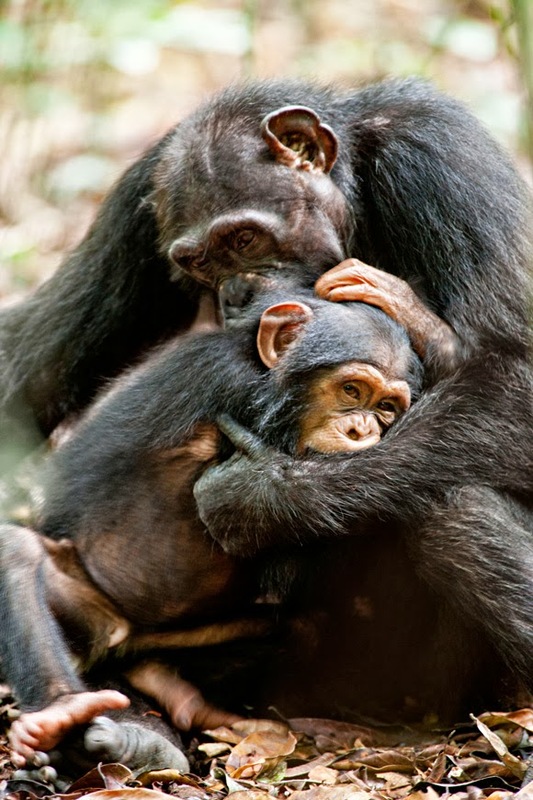 Sade loves her young chimps, but doesn't know what to do with her son, Yenee. Ada is very obedient, polite, and truthful. Each time Sade asks Ada a question she knows Ada will answer truthfully. Unfortunately, this is not the case with Yenee. 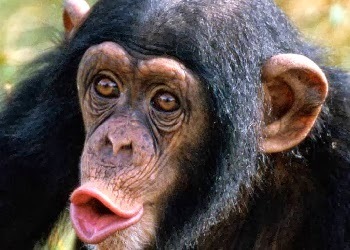 For instance, a while ago Sade told her chimps to clean up the sticks and rocks they brought into their nest. Ada and Yenee along with a few other chimps had taken them up to the nest to play with. The chimps left their mess and they needed to clean it up. Ada and Yenee swiftly swung up toward the nest. Sade turned to talk to a friend of hers. 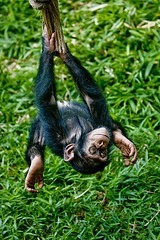 As she was talking she noticed Yenee and another chimp playing and swinging upside down on a branch near the ground. “I don’t know.” answered Yenee. Later, Sade saw Ada and asked her where she had been. “Did Yenee help you?” asked Sade. “Not at all?” asked Sade. “He didn’t come to the nest. I cleaned it up myself.” said Ada. Sade found Yenee and talked to him about telling the truth, obeying, and helping his sister. She made him stay with her for the reminder of the day. He was not allowed to play with the other chimps. One day, a young chimp and his mother came to Sade and explained how mean Yenee had been. 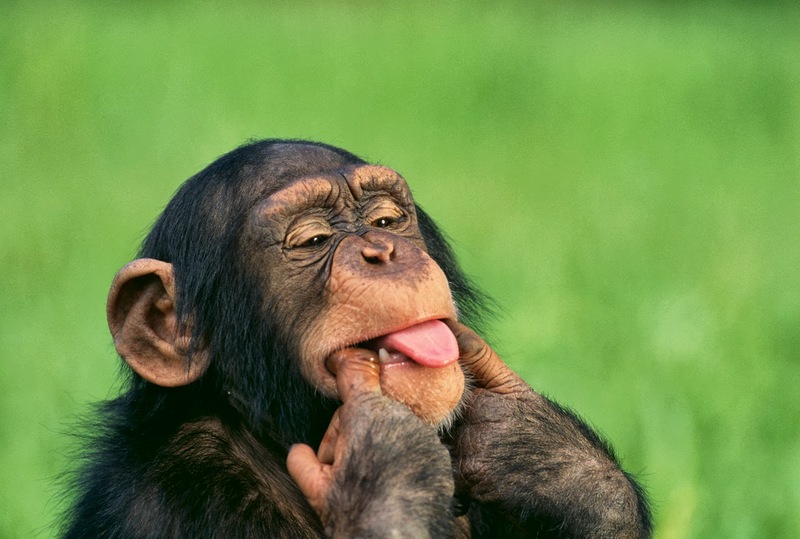 He stole a banana and made faces at the young chimp. Sade asked Yenee about it, but he denied it. Sade was worried. At first, she thought he would outgrow it, but it was becoming apparent he wasn’t. Every time she questioned him, he lied to her. He was becoming so accustomed to lying he told a lie even if the truth made a better story. He didn’t act like he knew how to tell the truth. She didn’t know what to do about him. A while ago, Ada and Yenee were getting ready for school. In school they learned survival skills. They were taught how to tell which plants were good to eat and which ones were poisonous. There were many kinds of snakes in the jungle and they needed to learn which ones were dangerous. They also learned what tracks different animals left. Yenee liked school, but on this day he kept looking into the jungle off in the opposite direction. As soon as he and Ada were out of sight, he zipped away swinging from limb to limb, tree to tree. Ada called after him, but he just swung away faster. Ada continued on to school hoping he would come later. After school, Ada came home alone. Sade asked, “Where is Yenee. Did he leave school when you did or was he detained by his teacher?” Ada explained what had happened. She took Sade where she saw Yenee disappear. Meanwhile, Yenee was far away sitting in a tree. He was not alone. With him was a young gorilla. 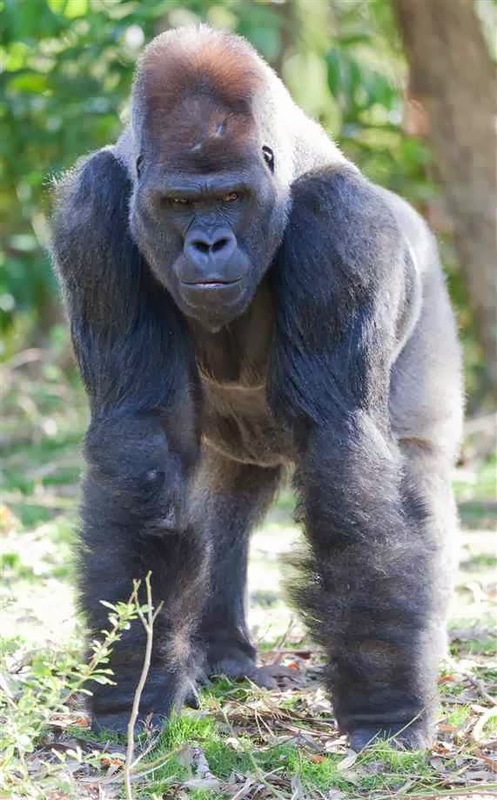 Yenee told the young gorilla that he had run away because the community was very mean to him. He said they made him do all the work and beat him if he didn’t do exactly what they told him to. He said they kept food away from him and made him sleep by himself even in terrible storms. The young gorilla thought chimpanzees were like gorillas and looked after each other. He told his father, who was named Wasesa, pronounced Wah-seh-SAH and means "careless." Sade looked for Yenee for two days. Sad and worried, she went back to the community. Every day she watched for him. She hardly slept nor ate. Yenee didn’t come home because he was too busy telling lies to the gorillas and he loved being the center of attention. The gorillas were very concerned that the chimps had treated Yenee so badly. Wasesa was so upset by what Yenee had described, he got together a bunch of gorillas to go teach the chimps a lesson. 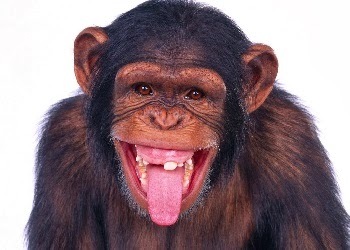 He said, “Our chimp friend has been terribly mistreated by his community. They must be punished. We need to teach them a lesson they will never forget. Yenee didn’t know what to do! Should he stay there, go with them, or hurry on ahead and warn the community that the gorillas were coming? He had been telling lies so long, it didn’t occur to him to stop them by telling the truth. He decided to hurry on ahead. He swung and leaped from tree to tree going as fast as he could. He got there first and told Sade and Themba that he heard gorillas plotting to make war with them. “They held me captive and I barely escaped.” lied Yenee. For the first time, Yenee didn’t know what to say. He was caught right in the middle of his lies. Soon, the gorillas came. The one who followed Yenee stopped the rest and told them what happened. Wasesa stepped forward. “We’re sorry we took Yenee’s word. We have a custom in our family that when one lies he is either killed or banned from the family forever, never to return. Lying is like a sickness and should be cut out. We leave you to decide. Yenee, you will not be allowed to come to us again.” The gorillas left. Yenee was reminded many times before he started to answer a question. It was a hard job to teach his tongue not to lie. He learned that lying is a terrible habit to get into and telling the truth is always the way to go. The bible says we should never lie. Deceit is another word for telling lies. The Ten Commandments tells us not to lie. Exodus 20: 16 You shall not bear false witness against your neighbor. Leviticus 19: 11c ...nor lie to one another. Verse 16 says You shall not go about as a talebearer among your people. Proverbs 12:22 Lying lips are an abomination to the Lord, But those who deal truthfully are His delight. Psalm 101:7 He who works deceit shall not dwell within my house; He who tell lies shall not continue in my presence. Psalm 34:13 Keep your tongue from evil, and your lips from speaking deceit. If you have a problem with lying, you can ask the Lord to help you. Psalm 120:2 Deliver my soul, O Lord, from lying lips and from a deceitful tongue. Memorize: . Proverbs 12:22 Lying lips are an abomination to the Lord, But those who deal truthfully are His delight. And/Or. Psalm 120:2 Deliver my soul, O Lord, from lying lips and from a deceitful tongue.